On the 3rd of January 2013, I picked up a copy of the Whangarei edition of Coffee News. This is a weekly publication that has different editions for various areas of New Zealand, and seems to contain a relatively high proportion of questionable advertising. I make a habit of looking at it whenever I get the chance, in case I find something I should complain about. In this case, I found what I was looking for. I wasn’t familiar yet with the product being advertised, but the claims sounded too good to be true so I thought it certainly warranted further investigation. Once I got back to my computer, I looked up the Innate Health website. There I found other advertisements like the one I’d seen in Coffee News. There was one advertisement for an “Ionic Detox Foot Spa” (scroll down on that page), and another for a “Quantum Magnetic Analyser Report“. As for their “Quantum Magnetic Analyser Report”, the way they described it didn’t even sound superficially plausible, and the spattering of pseudoscientific language didn’t particularly help their case. The product seems to be a hand grip connected to a computer, and allegedly when you hold onto the grip the computer will tell you what’s wrong with you. So far, I have laid 3 complaints against Innate Health with the ASA. There was absolutely no attempt made to substantiate any of these claims, making them in violation of the Therapeutic Products Advertising Code Principle 2. Because these statements used scientific terminology in an inappropriate way, I considered them to be in violation of the Therapeutic Products Advertising Code Part B2 R4.3. I also considered them to be in violation of Part B2 Requirement 4(a) and 4(b), because they abused consumers’ lack on knowledge in order to deceive them. I also argued that the advertisement violated Principle 3 of the Therapeutic Products Advertising Code, which requires that advertisements such as this exhibit a high standard of social responsibility. In response to the complaint, the Innate Health representative seemed to think that it was sufficient to explain to the ASCB that anyone wanting to buy their products could just search on Google for the product name and research it themselves. Instead of attempting to substantiate their claims they just told the ASCB how many results Google said it found when they searched for their product name. I have no idea why they thought this was a good idea, especially given that the ASA’s website has information available on how to respond to a complaint regarding misleading claims, but I guess that’s just what they decided to do. In complaints like this the onus is always on the advertiser to substantiate their claims. As they had failed to do so convincingly, the ASCB upheld the complaint and ruled that the advertisement be removed. The Complaints Board noted the advertisement for this product had been removed from the Advertiser’s website, but considered it was in the public interest the issues raised by the Complainant be addressed. I hope that this precedent may be useful in future complaints that involve advertisements with a short lifespan, such as GrabOne deals, which may be removed before the ASCB is able to meet and potentially uphold a complaint against them. If you would like to refer to this precedent in a complaint of your own, remember this is complaint 13/010. 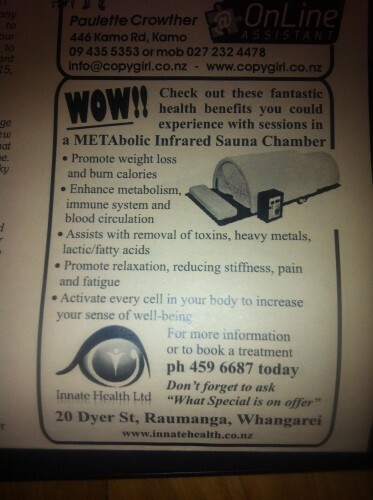 Honestly, I don’t doubt that sitting in any sort of sauna, including an infrared one like this, could be relaxing. The other claims though, particularly the claim about helping remove heavy metals and other “toxins”, were quite concerning. My complaint argued that the claim about “activating” your cells was an inappropriate use of scientific terminology, that the therapeutic claims made were unsubstantiated, and that it was highly irresponsible to imply that a serious condition like heavy metal poisoning could be treated in this way. Like in the previous complaint, the Innate Health representative’s tactic involved searching for their product on Google and reporting the number of results, so the ASCB upheld the complaint. Unfortunately, though, instead of agreeing with me that “Activate every cell in your body” was a misuse of scientific terminology, the ASCB decided it should be treated as “puffery”. As far as I understand, that basically means a claim that is exaggerated to the point of appearing so ridiculous that no one could possibly take it seriously, and therefore doesn’t require substantiation. I disagree with their decision here, but I got the result I was after overall. Quantum Magnetic Analyzer collect the weak magnetic field sensors of frequency and energy from the human body through the hand grip sensor. The instrument magnifies your body functions and the computer processes the information collected and compares with the diseases on record which are installed inside the instrument and compares against the standard spectrum. According to the results, the therapist is able to make an analytic judgement for the person and put forward standard advice for any preventive treatment that may be required. The complaint about this ad focused on similar points to the previous ones: its therapeutic claims are unsubstantiated, it’s socially irresponsible, and it’s taking advantage of consumers’ lack of knowledge. You can probably guess how the Innate Health representative responded to this complaint. That’s right, they searched for their product on Google and told the ASCB how many results they got. In light of this, the complaint was upheld. Despite this, and despite the fact that having a complaint upheld against you by the ASA means you are asked to remove the advertisement, Innate Health has not removed the advertisement. I have submitted a new complaint to the ASA regarding this. The Complaints Board said that even if there had been a disclaimer, that alone would not remove the responsibility to provide substantiation.